Zirbus technology GmbH has been manufacturing autoclaves for laboratories, research, medicine and production for over 30 years. Labstar 200. These autoclaves are now part of the successful Labstar series as new table-top units with an optional underframe. Made in Germany. Since 30 years Zirbus technology produces autoclaves for laboratories, clinics, production and the pharmaceutical industry with a optimized chamber volume up to 8000 litres. Our full range of Autoclaves are made of stainless steel and probably. Constantly we improve our products according to the needs of our customers. During the last years the product range was enlarged by steam generators and waste / wash water sterilizers. As a manufacturer of pressure vessels with HPO registration Zirbus technology has the flexibility to realize special requirements of the customer with regard to chamber size and pressure concept in addition to the standard serial products. The strict observance of the ISO 9001 certification guarantees the quality of the manufactured products. Autoclaves for laboratory are in conformity with DIN 58951. Autoclaves for the medical field are produced according to medical guideline 93/42/EWG, MPG 92/43 and DIN EN 285. The complete production of our machines is carried out in the factory in Bad Grund. Our own software development makes in possible to meet customer requirements fast and cheap. Thanks to our own application laboratory Zirbus technology is able to adapt or develop the sterilization processes to your product. Our own after sales service ServTec guarantees fast and cheap service. This service also includes services such as qualification and validation. Angular steriliser chambers according to the BoTec principal, high-strengthened and efficient. The results are shorter loading times and energy savings at the same time. 10 years guarantee for the inner chamber and the steam kettle. Due to the angular chamber, an optimal exploitation of the chamber capacity is achieved. Compared with a round chamber with equal chamber capacity, the loading capacity is 36 % higher. Case and support frame are entirely made of corrosion-free 1.4301/ AiSi 304 stainless steel, resistant to all common disinfectants. Further, the case has a semi-gloss surface for easier cleaning. All pipes exposed to steam are made of 1.4404/ AiSi 316L stainless steel and isolated particle-free. Pneumatically controlled steel valves for long durability and low operation costs. Touch screen control for highest flexibility and easy handling. All used components come from renowned manufacturers; therefore spare parts supply can be guaranteed for more than 10 years. Refitting is also possible after delivery. Which autoclave for what purpose? Used for sterilisation of small amounts of liquids, solid material and litter. Equipped with the technology of the large devices. Not suitable for pharmaceutical use, according to EU-GMP regulations, and as pass-through autoclave. Due to construction, i.e. vertical loading and unloading, this autoclave is especially suitable for sterilisation of light weight items, such as litter in sterilisation bags. A loading assistant enables a back-friendly ergonomic loading of items up to 25 kg, such as medium bottle and fermenters, is optionally available. Suitable for any kind sterilisation. In the compact version, available with usable chamber height up to 850 mm. Suitable as production and pass-through-autoclave for the pharmaceutical industry with gas-proof separation or as autoclave for sterilisation of nutrient media at university laboratories. These are customized autoclaves. They may be used for pit installation which enables ground-level loading. They may also be used for sterilisation of ampoules and bags by hot-water-sprinkling. Why angular and not round? The main advantage of round autoclave compared with angular autoclaves is the fact that pressure distributes equally throughout a round chamber. Due to modern production and manufacturing methods, an angular chamber may endure the same amount of pressure. The capacity of the sterilisation chamber can be entirely used, chamber capacity=working capacity. Thus, fewer charges containing equal loads can be sterilised compared to a round chamber with equal capacity. Saves energy, time and maintenance costs. 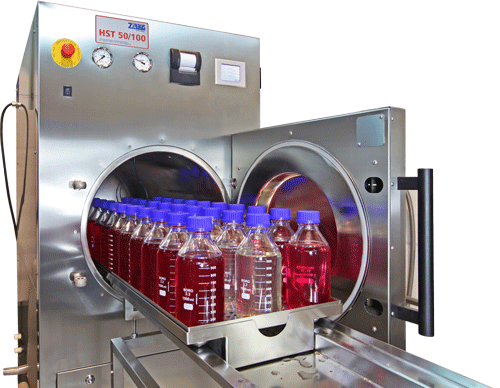 Required space for installation and loading/unloading of the autoclave is smaller because Zirbus Horizontal Autoclaves are equipped with a vertical door, compared to round chamber autoclaves which usually have large hinged doors that require much expensive laboratory space in front of the actual device. Fitted with a quick-release locking mechanism, an autoclave (Latin for “self-locking”) is a pressure vessel used for sterilizing instruments, liquids and other utensils. The contents of an autoclave are subjected to high pressure and heated with steam to temperatures of 121 degrees Celsius or higher for a defined period of time depending on the size and type of the materials involved. The autoclave was invented in 1879 by French microbiologist Charles Chamber (who also collaborated with Louis Pasteur), and was preceded by the steam digester, invented in 1679 by French physicist Denis Papin. Two main methods are now used for autoclaving or sterilizing: the vacuum method, which involves mechanically evacuating air and applying an inflow of steam for heat, and the downward displacement or gravity method, in which air is forced out by saturated steam (the pressure cooker principle). Autoclaves are also sometimes referred to as “steam sterilizers” as a result. Today’s autoclaves come in many different sizes and designs, and are used in the fields of microbiology, medicine, dentistry, mycology, veterinary medicine and prosthetics. Production-scale versions are used in the food industry as a way of increasing the shelf life of foods without refrigeration, and the electronics industry uses these instruments for creating bubble-free adhesive bonds in touchscreens. Pressure vessels even find their way into the construction materials industry, where they are used for curing lime sand brick and concrete. In research institutes and universities, specially developed laboratory autoclaves are used for medical, pharmaceutical and biotech research. Modern laboratory autoclaves have a steel, rectangular chamber, and high-pressure autoclaves withstand pressures of 150 bar (see high-pressure autoclaves). In order to minimize contamination from microorganisms, special requirements apply to medications manufactured in the pharmaceutical industry, where the sterility of production equipment and clean room clothing is a major concern. Instrument disinfection and sterilization are indispensable procedures in hospitals and medical clinics as well, where they ensure safe practices. Combining high temperatures and pressure to adequately sterilize instruments makes autoclaving an extension of hot air sterilization techniques, which sterilize instruments with heat. Some instruments cannot withstand high temperatures, however, and elevating the pressure makes it possible to treat instruments at lower temperatures. Autoclaves are increasingly being used in waste disposal processes as a way of treating and sterilizing garbage and hospital biohazard waste, neutralizing potentially infectious materials by applying steam under pressure. Temperatures of 121 or 134 degrees Celsius will destroy bacteria, viruses, fungi and spores, and the very few organisms—prions are one example—that can survive these temperatures must be denatured by other means. Other sterilization techniques must also be used for materials such as certain plastics that are unstable at high temperatures. Once treated in an autoclave, waste is no longer infectious and can be disposed of in an environmentally safe manner. Regular performance testing is mandatory for autoclaves used predominantly for sterilization.